For over 60 years, Kismet Rubber Products has been a leading extruder of custom silicone products. Our staff has the expertise and application knowledge to manufacture durable, high performance extruded parts using silicone and to assist with material selection to determine if silicone is the best material for your part. We serve the OEM and replacement part markets, specializing in electronic, aerospace, healthcare, construction, transportation, marine, food processing, appliance, and power generation applications. Silicone rubber is an elastomer that is composed of silicon, carbon, hydrogen, and oxygen. It exhibits good resistance to extreme temperatures, working well in temperatures from -148°F to +572°F. It is stable, non-reactive, and exhibits good tear strength and compression set. 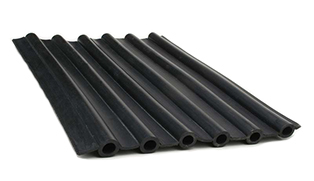 Silicone is available in a variety of grades that provide specialized properties, such as steam resistance, high tear strength, extreme high or low temperatures, corrosion resistance, and low smoke emissions. Silicone is used for applications where shape retention and mechanical strength are required in extreme or harsh operating conditions. Silicone is easy to shape and manufacture, and can be easily colored. It is used for a wide range of products exposed to harsh operating and corrosive environments and weather.